A major retrospective of Italian artist Alighiero Boetti: Game Plan is on at the Tate Modern until 27 May. Like his compatriot Burri, he is associated with the Arte Povera movement and the show opens with work he made from everyday objects in the late Sixties. He was soon exploring other ideas in his art, one of them being the image of the artist as divine shaman and public showman, but that duality inspired him to reach beyond his immediate world. The element of playfulness, of order and disorder, of patterns, time and language are themes that constantly run through his work. 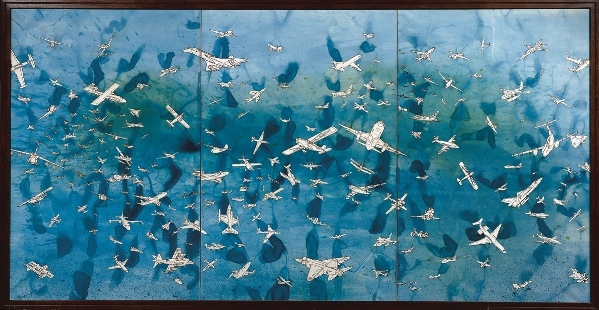 There are huge beautiful blue biro drawings which may display a consummate waste of time, but are also incredibly textural; tapestries made up of the names of the longest rivers which demonstrate the absurdities of classification and a series of postal works which play on colours of stamps and return-to-senders. 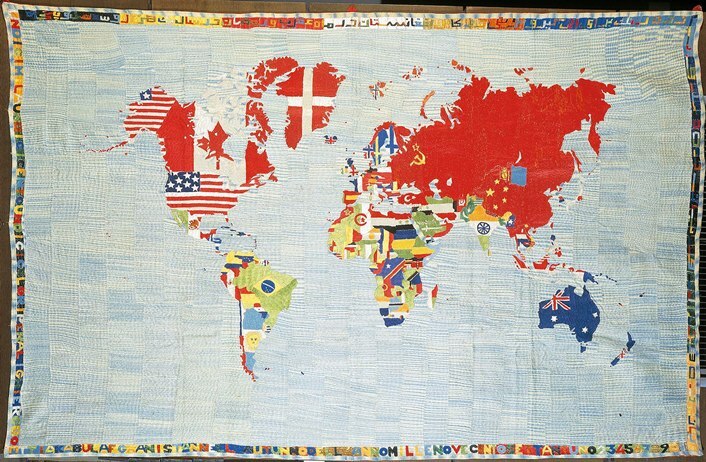 Throughout his life Boetti collaborated with other artists, many of them Afghan weavers who added their own voice to the maps he made of the changing world. From the randomness of a light that switches on for 11 seconds a year, and no-one knows when, to the marks on a tapestry that represent the chimes of a church clock, or a counting game, this is an artist who challenges the viewer to participate and the more you understand the rules of the games he is playing the more you will enjoy them.